New York Scissors made from cobalt steel with ergonomic, semi-offset handle. 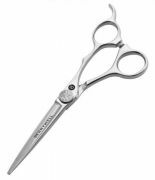 Particularly well-suited for classic styles and precision cuts. Scissors made from cobalt steel with ergonomic, semi-offset handle. Particularly well-suited for classic styles and precision cuts.